I have a bit of a confession to make. Even though my recipe index implies otherwise, I really prefer salty over sweet. For a while my “dessert” after dinner,would be a bowl full of salt and vinegar Lays (SOOO addicting and SOOO bad for you) rather than a couple of scoops out of a Ben and Jerry’s Pint. However, recently I have found a new way to get my salty-fix: jar pickles. Specifically, pickled sugar snap peas and spicy pickled carrots. 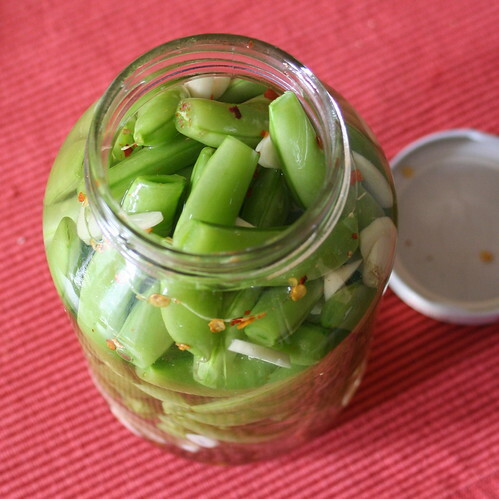 I tried pickling peppers last fall but I had forgotten about how magical a little brine and some time in the fridge can be on a jar full of veggies until I read Deb’s post about sugar snap peas. When the first harvest of sugar snaps hit the Nichols’ Farm table, I knew that I had to whip up a jar. Ironically enough, that night I made it to one of the last chapters in a wonderful little book and Molly described how her husband Brandon is a vinegar lover and she shared a few recipes of pickled produce that they served at their rehearsal dinner. One was Spicy Pickled Carrots w/ Garlic and Thyme. She also shares a picked grape recipe that I will have to try once grapes hit the market later in the summer. I haven’t tried the carrots yet because they need a little more time than the sugar snaps to absorb all the briney goodness but the sugar snaps are addicting. Dave and I ate them in 3 days flat, and I have already made another jar full this afternoon and will likely make them a few more times while sugar snaps are in season. Give them a try. You will become a pickling covert like me. And you won’t even miss the big bag of Lays. Deb mentions that original recipe suggests you store the jar in the refrigerator for two weeks before eating the pickled peas, but it is likely that you will start eating them the next day, and the jar will be gone a few days later. They are that good. In a medium saucepan, combine 1 1/2 cups apple cider vinegar, water, sugar, thyme, garlic, black peppercorns, red pepper flakes, salt and mustard seeds. Bring to a boil over medium-high heat, then reduce to a simmer and cook, stirring occasionally, for 10 minutes. Remove the pan from the heat, and let cool for 5 minutes. Stir in remaining 1/2 cup vinegar. Put the carrots in a large, heatproof bowl, and pour the warm brine over them. Cool to room temperature. Note: Molly says that they should last in theory indefinitely in the fridge but she doubts they will last that long since you will love them. Try to eat them in a month or two. This entry was posted in Appetizer, Farmer's Market, Side, Snacks and tagged A Homemade Life, Carrots, Green City Market, Pickling, Smitten Kitchen, Sugar Snap Peas, Vegetables. Bookmark the permalink. I have never tried pickling anything, mostly because it kind of scares me. I think that these recipes may help me get over that! Hope you had a great weekend, despite the weather! Mara-It is really easy! If you like salty snacks totally make the sugar snap peas. SO GOOD. I want to try pickling! Everything you made sounds and looks amazing. I’m a salty person too! i’m just getting into pickling. i like the idea, not always the outcome, but these look tasty. yum! Hey Whitney, nice recipes 🙂 i will give them a go when i get a good haul of sugar snaps from the garden! And When someone talks about strings removed, it meas that if you just snap the tip of a podded veggie (like Sugar snap peas, beans etc) it should just stay attached by the side which is stringy)If you look at the pods you can see clearly different lines down the sides of the pods. One of our favorite restaurants, Mexican, offers pickles carrots, onions and jalapenos with the starter bowl of fresh chips and salsa. My husband can’t get enough of them, so I’m thinking this would be fun to try and pair with a little enchilada dish or maybe tacos. Thanks! YUM! I just found your blog on tastepotting, and I will definitely be making both of these this weekend – I love pickles! And, Molly’s book has been waiting for me to dive in for a couple weeks, so your post is another reason for me to get reading! And, it’s always nice to bump into another Chicago blogger – Nichol’s is definitely my favorite farm in the area, and I seem to make monthly treks to the Spice House. Wonderful job on the blog – all your pics are beautiful! Oh I love these. Though I blog a lot of sweet stuff, at heart, I’m a savoury person through & through! This jar is singing to me! YUM!! Wendy-It really is easy, I hope you give it a try! Megan-I am SO making strawberry jam next. Just need to buy some canning jars. Kelly-I’m sure it would be right up your alley. Stefan-That makes sense. I think mine just weren’t that stringy? Deeba-Thanks for stopping by. Your blog is lovely! 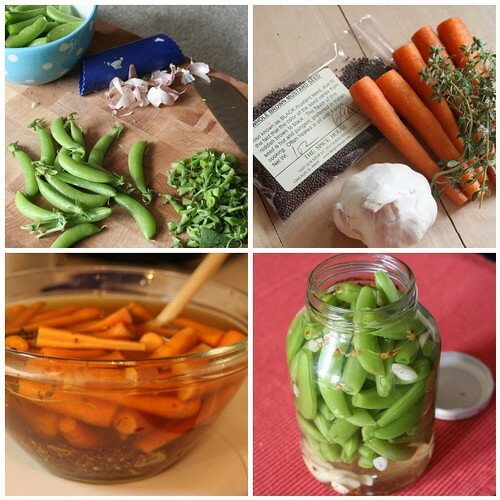 I’m definitely going to try both of these (well, sugar snaps might be almost done, so the carrots) this summer – I’m finding I like pickled things more and more each year. I don’t have any experience preserving vegetables but if you go to the blog foodinjars.com or the Blue Book of Canning you could probably get better information about proper water bath times and what-not. Good luck! Let me know if you find a great way to do it. I made pickled spicy green bheans for the 1st time this summer and they were a hit. 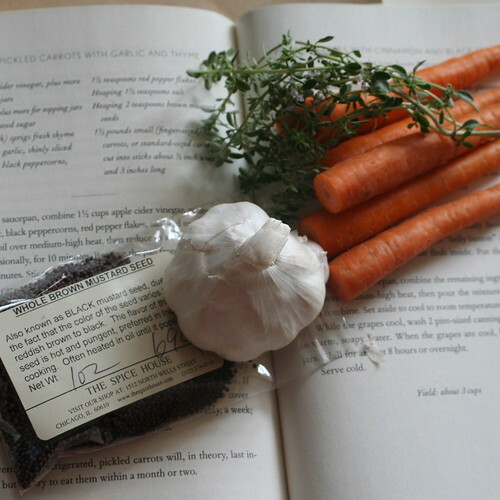 I’m going to have to try your pickled carrot recipe…it sounds delish!